If you are looking for a fast growing tropical tree that produces shadow quickly the Butterfly Pea tree (Clitoria racemosa) is a good solution. This beautiful ornamental tree from Brasil grows quickly even on terrible soil. 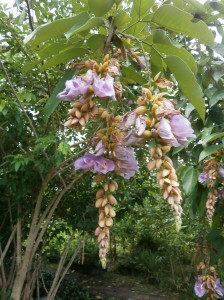 At Discovery Garden in Pattaya (Thailand) we have trees for show and sale as well as fresh seeds of clitoria racemosa.